Tempted by offers to buy 10,000 Facebook Likes for $40? Before you do, let’s step back for a moment. Why do you want Facebook Likes? If you just want a vanity number of Likes to look “Big” or “Popular” then go for it. But if you really want to derive ANY business value from your Facebook Page, then STOP RIGHT NOW. This article will dive into how buying likes works, why I recommend against it, and then give you three awesome strategies to generate real Likes that work for your business and maximize your Facebook ROI. Where do “Bought” Facebook Likes Come From? Who Are These Users? The most “legitimate” site I checked out, Boost Likes, puts a lot of emphasis on them being “Real”, although I’m unsure what they mean by that. “Real” as in the Facebook account exists? Even if they are real people, there is no way to choose ones who will actually be interested in your business or industry. It’s just a generic mixed bag. And who knows what country they live in or what language they speak. In reality, there will be a very low likelihood that any “real” accounts that Like your Facebook Page will have any interest in buying from you in the future. Still think that buying Facebook Likes is a good idea? Having 10,000 Likes on your Facebook Page doesn’t mean much if they aren’t engaging with you. Bought fans don’t engage because most of them aren’t real people. Even if they are real people, they aren’t at all interested in what you have to say. EdgeRank is Facebook’s algorithm that determines which posts go into users’ News Feeds. It’s difficult enough to get your posts into the News Feeds of your Facebook Fans as it is, but when your Facebook Page has little or no engagement (especially with a large number of Likes), your EdgeRank will drop and no one will see your posts – including your real Likes. OK, let’s say that the unthinkable happens and these bought Likes do engage with your Facebook Page. This will be good for your overall Edgerank, but not with the Likes that actually matter to your business. It will basically create a red herring in your Facebook Insights. Although you’ll see a lot of engagement, it won’t be coming from the people who are really interested in your business. Facebook Pages, like any marketing channel, are meant to help generate more sales for your business. If you’re just engaging with people on Facebook who have no interest in the products or services you sell, then it’s a futile activity. As I mentioned above, you may be able to engage these Likes with certain posts that they are interested in, like pictures of cats, but your chances of engaging them with posts in your industry niche and converting them is zero. Facebook contests are still the fastest way to engage users, and although like-gating is now a thing of the past, they can still generate Likes for your Page. If a participant enjoys your contest idea and wants access to similar contests and promotions in the future, simply asking them to “Like” your page can result in new loyal Fans. How Does a Facebook Contest Get Users to Like My Page? Many people think that without the Like-gating feature contests are no longer useful in generating Likes, but that’s not true. A contest still engages users, educates them on your brand, and makes them want to gain access to win more valuable prizes down the road. The fact that a user is on your Page shows they are interested in your brand. If they are willing to go through the effort of filling out a form, they’re someone you’re going to want to build a relationship with. You now have the option to include a “Like” popup on your contest tab to capture users and connect with more current and potential customers. By politely asking for a “like” at this point in time, users are more likely to feel inclined to say yes. The popup is just one more way to grab those who are already interested in you at the right moment. 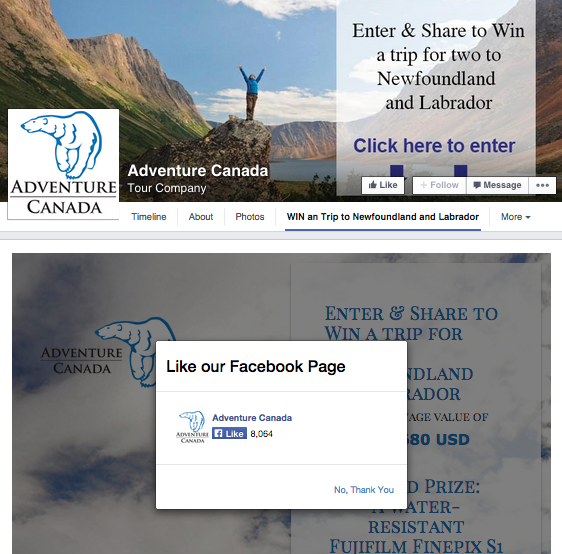 A perfect example of a “Like” popup can be seen below from Adventure Canada. After contests, coupons are the best and fastest way to get new Likes. Studies have shown that 57% of social media users Follow a brand for access to competitions and free stuff. Even something small like a 25% Off coupon to your store will do the trick. Using a Facebook Coupon App like Wishpond’s makes it easy to create a Tab on your Facebook Page where people can download a coupon. And just like with the Facebook Contest App mentioned in the previous section, you can add a “Like” popup to your coupon. 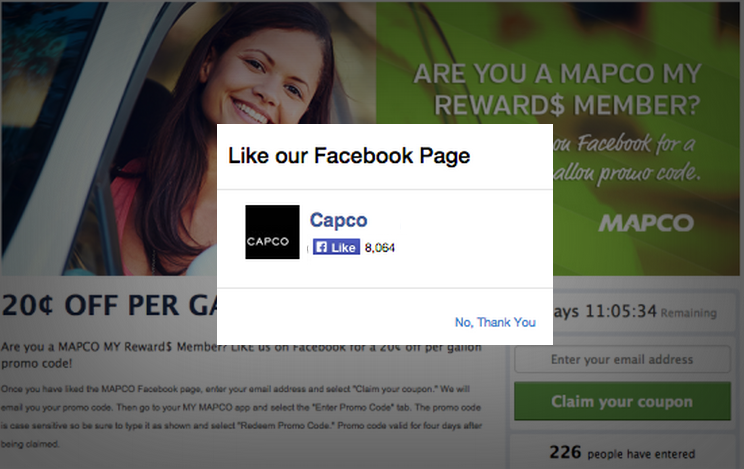 Another way to generate Likes from a coupon is to feature it on your website. Visitors to your website are obviously interested in purchasing from you, so a free coupon will be very enticing to them. And as they’re already showing interest in your business, they are perfect people to have Like your Page and engage with. Why should you pay to advertise on Facebook? Because it’s extremely effective. Facebook’s targeting options make it easy to target a precise audience of people who are highly interested in your products. Not only that, but Facebook offers a budgeting option specifically for the goal of generating Facebook Likes called Cost-Per-Like. By effectively testing and targeting Facebook Ads, we’ve been able to drop our Cost-Per-Like to as little as 20 cents. Learn how to A/B Test your Ads to get the lowest Cost-Per-Like. The best way to use Facebook Ads to get new Likes is to use them in conjunction with a Facebook Contest or Coupon. Just make the click destination for your Ad be the contest or coupon Tab on your Page. Have you or anyone you know tried buying Facebook Likes? How’d it go? Let me know in the comment section below!